DERRY GAA: Minor final can be springboard for McErlain's crop of 2017! With the press gathered around him underneath the Cusack Stand on Sunday, Kerry manager Peter Keane delivered a message that every member of the Derry Minor panel should have been present to hear. Keane was not referring directly to Damian McErlain’s Oak Leaf team, not even to the final itself, but his message was more relevant to the young Derry players than any one else in Croke Park. Conleth McShane looks on as Kerry lift the Tom Markham Cup on Sunday. It wasn’t feint praise for a vanquished opponent. Keane was describing the ‘mystery’ of the transition from minor to senior and when the dust finally settles on a hugely disappointing final, each and every one of the players who have captured the imagination of the county would do well to remember Keane’s words over the next three or four years. Forget the inquisition. Hindsight makes every one a tactical genius. Double up on Clifford? Play a sweeper? Start Callum Brown? These would have been foremost in the discussions of all Derry supporters following Anthony Nolan’s final whistle on Sunday. You can bet the same thoughts were racing through Damian McErlain’s head also. But can any Oak Leaf supporter honestly say they would have made radical changes to a playing panel and system of play that had served the team so well all year? Look at the memorable semi-final victory over Dublin. Derry’s high pressing game worked well and limited the quality possession (and thus the impact) of players such as Ross McGarry. Derry had every reason to employ similar tactics on Sunday. The problem is that even with limited possession, David Clifford is a phenomenon at minor level. To drop two men on him or draft in a sweeper (or both) would have been to allow Kerry primary possession and the space to build attacks at will. It also conveniently ignores the considerable threat posed by the 14 other Kerry players who would have revelled in the extra space provided. Remember Fiachra Clifford scored two goals of his own and while his namesake, David, is undoubtedly the star, this is anything but a one man Kerry team. The day turned into a perfect storm for Derry who ran into a fabulous team at the pinnacle of their powers on a day where the Oak Leafers were slightly off the pace. That’s all it takes and while it won’t seem like it now, these young men can become better players for the horrible experience that was Sunday. And for all the hurt that a defeat like Sunday’s can cause, it cannot eradicate the previous 12 months. This team are still the Ulster champions. “It was just a tough day at the office and it’s a pity that we suffered a defeat like that when the lads have worked so, so hard all year,” said Damian McErlain. “They have been very, very good and done so much for Derry football this year. Whatever plans Damian McErlain and his meticulous management team had laid out prior to throw in, it took Clifford only 11 seconds to throw them into disarray with the crucial opening goal. Midfielder Diarmuid O’Connor won possession and threw a long ball in toward his talismanic captain. Conor McCluskey was man-to-man with Clifford and the Kerry captain showed exactly what all the fuss has been about with a brilliant low finish. It was a hammer blow, not so much to the score-line but to the collective confidence of the Oak Leafers and while they recovered well to bring it back to 1-02 to 0-04, uncharacteristic little errors hinted at the shock to the system they had received. It was stick or twist time. Derry stuck. The conundrum was that to drop further men back at that stage would have only handed the impetus even more firmly to Kerry. There was no point trying to defend a three point deficit by handing Kerry easy possession from their own kick-out. For a while it seemed to be working. Derry recovered composure and had brought the game back to 1-02 to 0-04 before 10 minutes had elapsed. Then Clifford took over once more. He had already sent Jack Griffin clear only for the Kerry ‘14’ to shoot inches wide but in the 14th minute Clifford decided to do it himself again. It was another routine ball in, this time on the left but after the finesse of his first goal, Clifford this time showed his strength, shrugging McCluskey and two other Derry defenders off before bundling his way into the square and scuffing a shot over the line for 2-02 to 0-04. That was two sides of his games showcased. Now for a third and it was another knife through the Derry team. Back on the right, he orchestrated a yard of space for himself, turned inside and played an inch perfect pass into the path of Fiachra Clifford to send him clean through. Clifford No. 2 had obviously been watching his illustrious namesake and finished in a similar style for a seven point lead and basically ended the match. Shaken by the goals, Derry managed only one further point in the half, Dungiven’s Richie Mullan getting himself on the scoreboard. That return was in stark contrast to the other end where that man Clifford reeled off three successive point and Donal O’Sullivan also fired over. Jack Griffin sent over the last score of the opening half and by then, the final looked long since over at 3-08 to 0-05. The second half was only about the margin of victory despite particularly positive displays from Limavady Wolfhounds duo Oran Hartin in nets and substitute Callum Brown. Brown’s strength and raw power caused Kerry problems every time the ball went in as he manufactured the Derry penalty, scored by Patrick Quigg and could have scored a goal of his own minutes later. In truth though, it was nothing more than though because whatever threat Derry posed it could be doubled at the other end and for all Derry’s second half improvement, Kerry actually improved on their first half tally by hitting 3-09 in the second period. While any lost final leaves a few ‘what ifs’ to ponder for Derry, the victor was never in any doubt. To illustrate the point, Clifford helped himself to 4-04. Derry had no answer to him but, then again, no one has had this year. “Clifford is an unbelievable focal point for any team and when the team is going well, that gives Clifford the opportunity to go and do something individual that turns the game,” added the Derry manager, “They had some exceptional players all over the pitch and, again, we knew about that coming into the game. 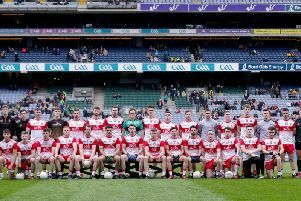 So Peter Keane, David Clifford and Co. are All Ireland champions again but if these young Derry players heed the Kerry manager’s message from under the Cusack Stand on Sunday, there is nothing to say they may not join them one day.